Smoking is part of the personal lifestyle of many people. SpringPear® Cigarette Box is an absolute classic storage jar and an absolute must have for any smoker. Usually a cigarette is crowned with a special moment, or let us pause for a few minutes for thoughts to wander. The cigar box holds about 50 filter cigarettes or even the self-made rolls produced in advance crease-free and shockproof. In this storage box you can buy cigarettes, tobacco, tea, coffee beans, flour, coffee beans, nuts, salt, Sugar, spice, cotton swabs, cotton swabs, cotton, nail files and cosmetics. We offer you good value for money if you have questions or problems, send us a message, we are at your disposal. Multifunction box: This small box holds cigarettes, tobacco, tea, coffee beans, flour, coffee beans, nuts, salt, sugar, spice, cotton swabs, cotton swabs, cotton, nail files and cosmetics. With a diameter of 6.5 cm and a height of 10.5 cm, our cans can hold about 0.26 liters without being bulky. Suitable for use at home, in the office, in the car or while traveling. As a cigarette case, the storage box can hold about 50 cigarettes up to 100mm (3.94 inch) in length. The elegant design is made of high quality stainless steel with low weight, ideal for carrying in a briefcase. 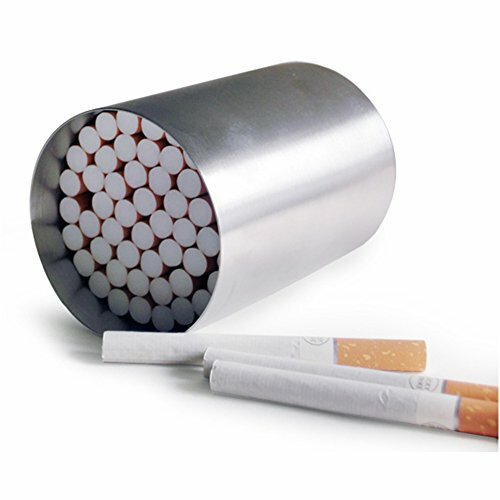 The material is very stable, it can well protect the cigarette, so that the cigarette is not affected by moisture and mold. This cigarette case is an absolute classic in the storage container and absolutely necessary for every smoker. If you have any questions about this product by SpringPear, contact us by completing and submitting the form below. If you are looking for a specif part number, please include it with your message.